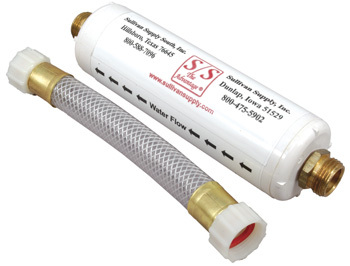 Sullivan's Water Purifier [WP] : Highland Livestock Supply, Ltd, Products for all of your show animals! This is an ingenious tool that removes chlorine and other harmful elements from water. The perfect product to keep your animal drinking while on the show road. It is also very good to use at home while you are rinsing and washing your livestock. Purifies so you have water similar to natural rain water. Helps to promote better hair growth and reduces flaking skin. Simply screw Water Purifier on your faucet.